The PA 800 plus Pharmaceutical Analysis System* was designed in collaboration with biopharmaceutical development and QC groups. This platform provides analysts with robust and easy-to-use characterization, integrating quantitative, qualitative and automated solutions for protein purity, charge isoform distribution and glycan analysis. 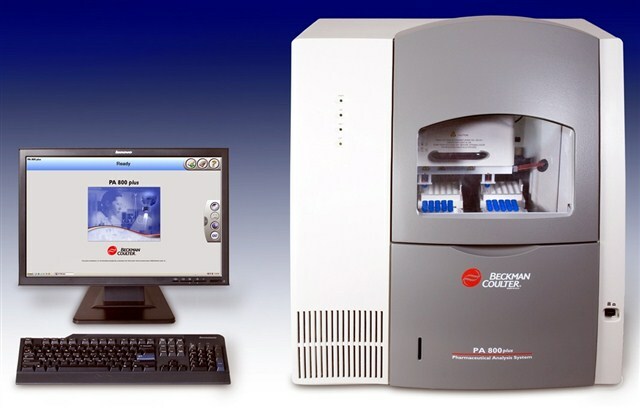 During the design of the PA 800 plus, Beckman Coulter emphasized assay portability, enhancing the overall system utility in multi-user, multi-instrument facilities. The PA 800 plus Pharmaceutical Analysis System provides a comprehensive, automated, and quantitative solution for the characterization and analysis of proteins. Innovative system design ensures dependable operation and durability. The PA 800 plus application menu includes SDS-gel molecular weight analysis, charge heterogeneity analysis utilizing advanced capillary isoelectric focusing technology, and carbohydrate profiling for the assessment of glycoprotein microheterogeneity. Modular design provides for the simple interchange of detectors. The PA 800 plus Pharmaceutical Analysis system, the PA 800S plus provides an automated and quantitative solution for the analysis of protein purity and molecular weight utilizing SDS-gel capillary electrophoresis. The innovative system design ensures dependable operation and durability. Additional detectors are available for future upgrades. What are the differences between these two generations of the Beckman CE instrument? There are no threads in SCIEX PA 800 plus Reviews at this time.